Today our deal hunting editors have found you some really cheap flights to Cartagena, Colombia. Fly with LAN Airlines this year in September and get a flight from Los Angeles for $569 r/t with taxes and fees – baggage fees not included. Our deal hunters have found this flight while searching on Travelgrove, but it was originally provided by Faredepot, so that is where you should start your search. Still, if you are smart, you also check some of the other providers to see who has the best rates. Your Cartagena flight with LAN Airlines starts from Los Angeles International Airport (LAX) on September 3 and returns from Rafael Nunez International Airport (CTG) on September 10. The flight has got two stops both ways: on the way to Cartagena there is one in Miami and one in Bogota and on the way back there is one Bogota and one in Dallas. For booking such an airfare LANPASS, the airline’s frequent flyer program, will give you 8,338 award miles. This amount is about 12% of a free flight from the US to South America. 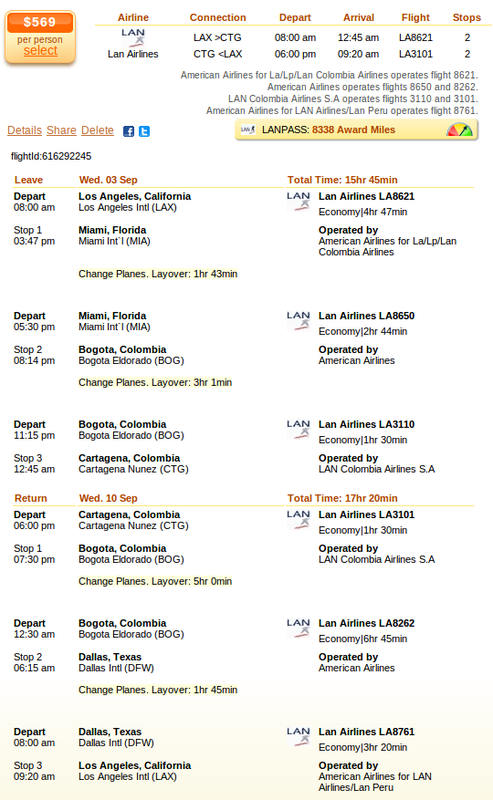 LAN Airlines offers the cheapest fare to the Colombian city of Cartagena, it costs only $269 r/t. The next best offer by Avianca Ailrines is already $593 r/t, which is $24 more expensive. Check the best offers we have found and book the airline you like the most. This entry was posted on Monday, June 16th, 2014 at 10:37 am and is filed under Airfare Deals. You can follow any responses to this entry through the RSS 2.0 feed. You can leave a response, or trackback from your own site.